You will need cardboard from a cereal packet or other spare card lying around. Don`t take anything from your dad`s office, especially any folders with important looking docs inside. 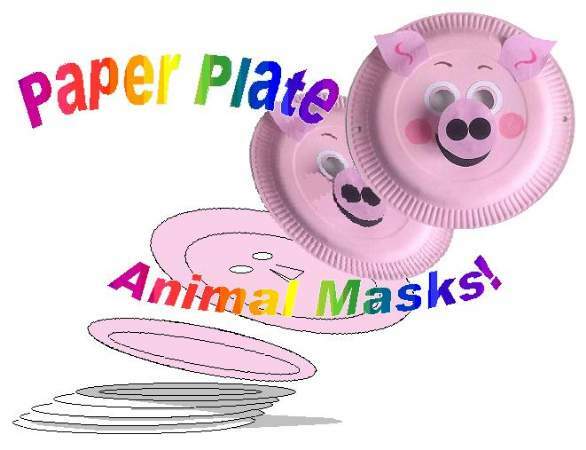 Once you get your cardboard, settle down with some scissors, black paint, a piece of A4 paper, a black felt tip pen, a piece of sheering elastic or any thin elastic will work, some pink and white felt or paper will do, a few crayons, glue, and we`ll show you how to make a mask. A Kool Kids Crafts mask. Fold the A4 paper lengthwise and draw half a cat face on it like the picture above. You may want to use a ready made cat mask stencil. When making masks this way, it ensure the faces will have identical eyes, ears, and whiskers, and a centered nose, making them look professional. Another point! This mask in the picture was made to fit my face. For a kid`s face draw the nose higher up and the eyes much closer together. After you cut the stencil, open it up and place it on the cardboard and put a few small pieces of tape to hold it in place. Once you finish taping, take the black felt tip pen and draw around the stencil. 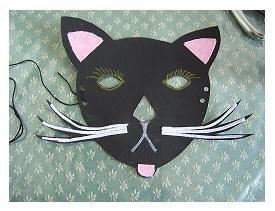 Draw the nose and eyes in, remove the stencil and cut out your cat mask. You don`t really need a lot of materials for making masks, especially this one. It depends on how much you want to dress it up. We only need a little to highlight the ears eyes whiskers and tongue. But before we do that, we need to paint the cat`s face. You can paint your cat whatever color you like, but black is more dramatic. Once you cover the whole cat mask with paint, leave it to dry. Oops! It`s gone curly! Don`t worry, you can ask someone to give it a quick press with a steam iron between a newspaper. That works a treat but you still want it to curve a little round your face. Can you see in the picture how I have used the felt? I cut out two little triangle shapes for inside the ears, a half circle for the tongue, and some thin strips for the whiskers. I like the felt better than paper because it can bend to the shape of the whiskers. Glue them on. Now the finishing touches. Draw in the eyelashes with a light pencil or some paint. You can dress it up if you like with sequins, glitter and other craft materials. Alright, your done! If you can find a hole punch, do 2 each side to tie on your elastic. Making masks is fun isn`t it. What`s next? Some scenery?? ?